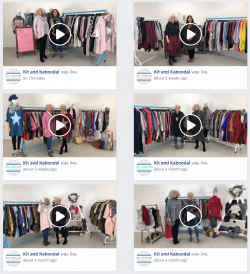 Have you seen our Facebook Lives? Every Thursday night we stock the rails in the studio, do our make up and dress for sucess for our 6.45pm Facebook live! 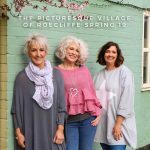 The lives are videos of our team showcasing our best selling styles and new arrivals, showing you how to style them, what colours they come in and more. It’s a crazy forty minutes flying through over 10 styles with the team stepping out quickly to change into nearly every piece on the rail. The videos are so popular because it’s a great opportunity to see the garments in motion and styled. The live videos are also a great opportunity for Q and As about anything Kit and Kaboodal. We have real-time comments about the pieces we are showing, we offer advice on what to wear for any upcoming events you might have, and we give you ideas of how to wear the same item in lots of different ways. On the lives we often launch promotions and special offers. So if you want to have your finger on the pulse and be the first to hear about any Kit and Kaboodal news then tune in at 6.45! Promotions in the past have included free delivery, Black Friday sales and free gifts with your order. If you find out about offers on the live it means you have the longest time possible to enjoy it, you can make the most of the offer and order away. Plus every Thursday night is a chance to win a prize! With every live we have a competition to win a gift voucher. We could be giving away five £25 vouchers, it could be two £50 vouchers, but it’s always a great giveaway! All the competitions are interactive with people entering by commenting on fun and seasonal topics. We have already had people sharing festive plans, their style icons and favourite songs, films and more. It’s always fun thinking up a new live topic to get us all interacting! 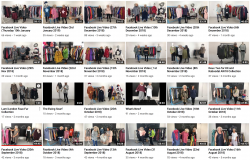 At the end of the forty-plus minutes we annouce the winners so they can get online and treat themselves straight away to their favourite style from the live.We also post the video on our Facebook feed afterwards, so if you are busy at 6.45pm you can watch later on that night – or even the next day! Or if you want to save them up and binge watch Kit and Kaboodal head to our YouTube channel where we have hours of content to fill up your evenings! You can even subscribe to the YouTube page so you can be notified of new videos and see them on your YouTube homepage. The only warning we have is that if you’re watching at a later date then styles may have sold out. We often come in on a Friday morning to find people have gone wild ordering all the latest styles and we have masses of messages of people requesting to be added to waiting lists of styles which have already sold out on our site! So if you’ve never seen a video please head over to our Facebook this Thursday at 6.45pm to watch for the first time. Don’t forget to enter the competition for your chance to win a gift voucher! And, if you’re an avid viewer then keep tuning in and look out for some exciting change ups in our 2019 videos.